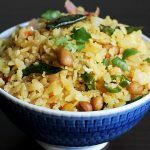 Aval upma recipe or poha upma or atukula upma – One of the easiest and healthy South Indian Breakfast recipes using parched rice or flattened rice. 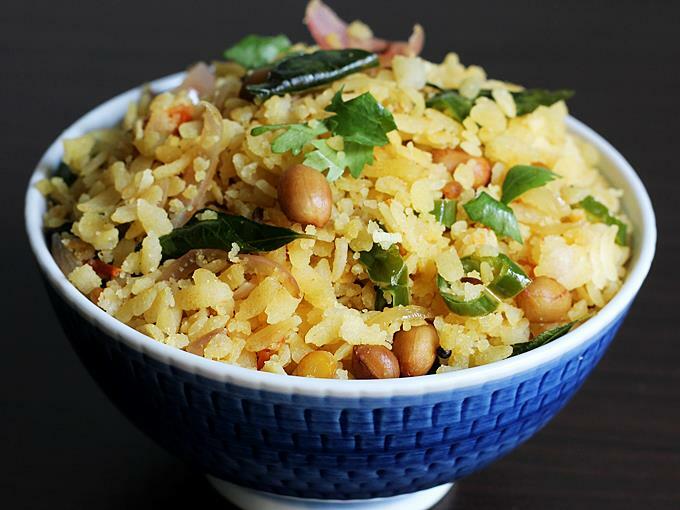 Poha or aval is used in many parts of India to make various dishes that are most commonly eaten for breakfast or snack. Aval upma is the South Indian style of preparation which is a variation to the basic rava upma. This can be eaten with plain yogurt or with a cup of tea or coffee. Making aval upma is very quick and can be made just under 15 minutes. I have shared only the basic version here. You can also use mixed veggies to add some nutrition to the upma. Potatoes, peas, capsicum and carrots go well in this dish. 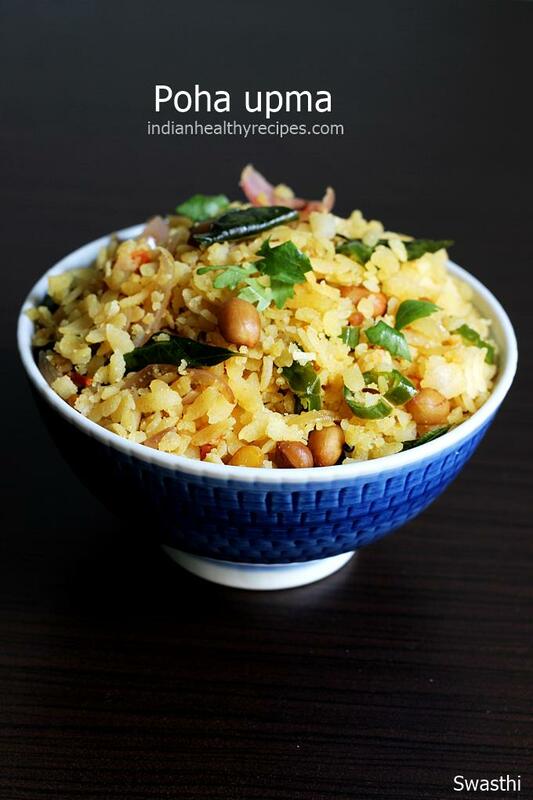 Poha upma can also be packed in the tiffin box for the kids or can be had for a after school snack. I have used white poha but it can be made using red poha too. Please note that aval upma cannot be made with thin aval or poha as they become soggy and mushy when rinsed. 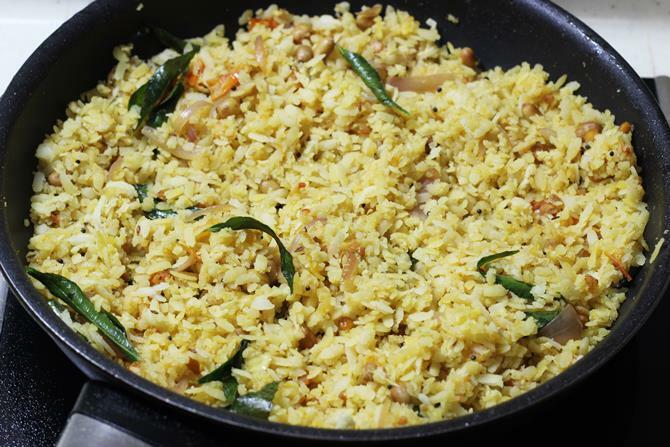 Thick or medium poha will give you a nice dish that is not mushy or too soft. Upma made using beaten rice called as poha, aval, avalakki. Aval upma is a south Indian dish made for breakfast. It can be served with a cup of tea, coffee or curd. Fry till golden, then add mustard, cumin and hing. When the seeds pop, add onions and curry leaves. Fry till the onions are slightly fried. Add tomato and sprinkle turmeric and salt. Fry till the tomatoes turn mushy and the raw smell of the tomatoes disappear. 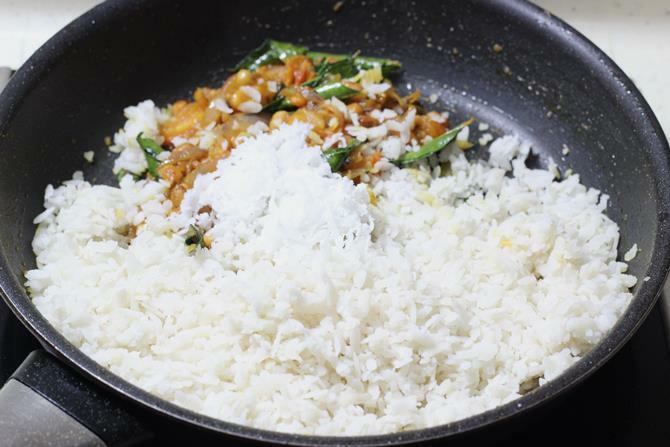 Add poha and coconut. Mix and let it warm up on a medium heat. If needed cover and warm up to prevent it from becoming dry. Serve aval upma hot with plain curd or tea. 1. Add poha to a bowl and rinse them well. Drain the water completely and set aside. Thicker poha has to be soaked first for about 10 to 15 mins. Then drained. Excess moisture will be absorbed. Break the lumps and set aside. 2. 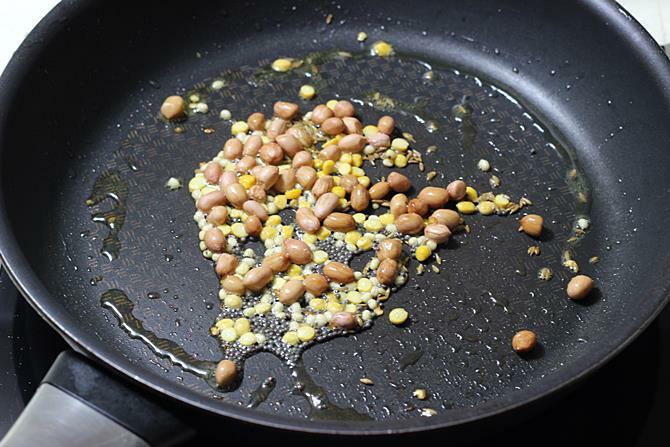 Pour oil to a hot pan. 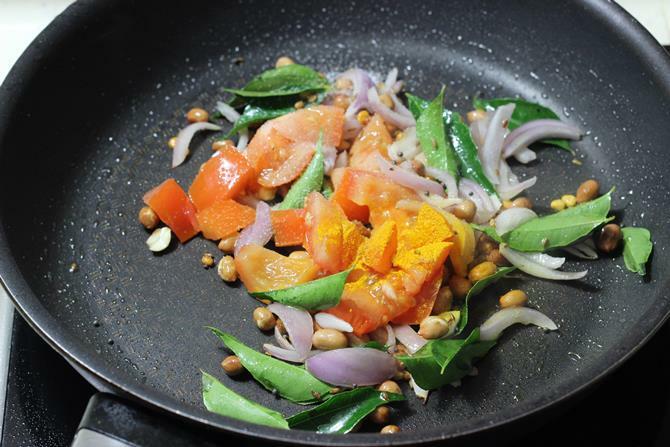 Add chana dal, urad dal and peanuts. Fry them until the dals turn golden. Then add mustard and cumin, hing. Allow them to crackle. 3. 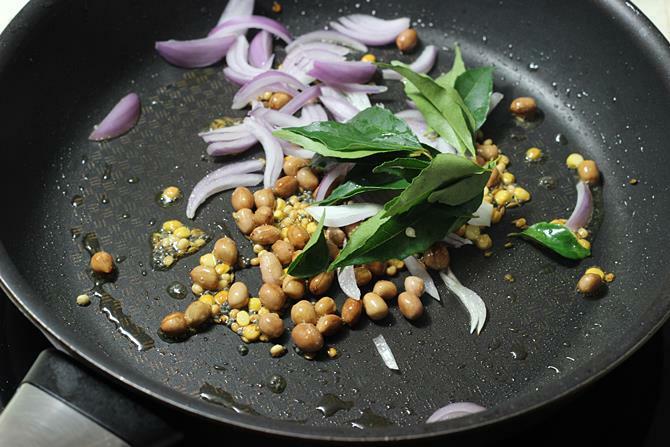 Add green chilis, ginger, onions and curry leaves. 4. When the onions turn transparent, add tomatoes and turmeric. You can also skip tomatoes and use lemon juice towards the end of making it. Fry until the tomatoes turn soft and mushy. 5. Add soaked poha and coconut if using. 6. Mix and then cook on a medium heat till the upma turns hot. Add lemon juice and garnish with coriander leaves. Nice recipe. Today I tried first time. It was good. Poha upma???? I don’t know how to do before 10mins. But now, because of your recipe I have prepared it very well. Very very tasty. Infact, my hubby loved it…. Made this today. My kids loved it. Thank you. mam I visit so many blogs but I like yours so much because ur presentation is very nice and the step by step pictures also. Iam glad you liked my blog Vanitha. Thank you so much for your time to leave a comment here. Hai day before yesterday itself I prepared very nice, my husband like this very much, and my mother in law also. Swasthi, you made this look so beautiful. Your….poha..looks. .lovely. .I too made it yesterday.